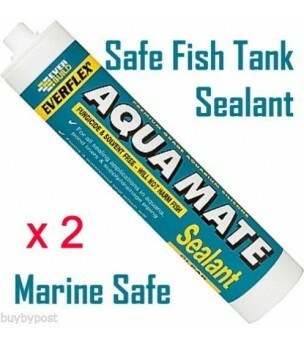 AQUA MATE is a high modulus, reactive curing silicone sealant specifically formulated for aquarium manufacture. It remains permanently flexible, forming a watertight seal This is a transparent silicone. 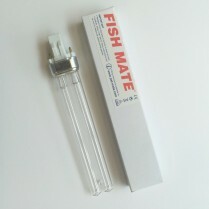 Free from fungicide and solvent - will not harm fish. Fast cure - gives quick early strengths. Waterproof seal - will withstand continuous water immersion. 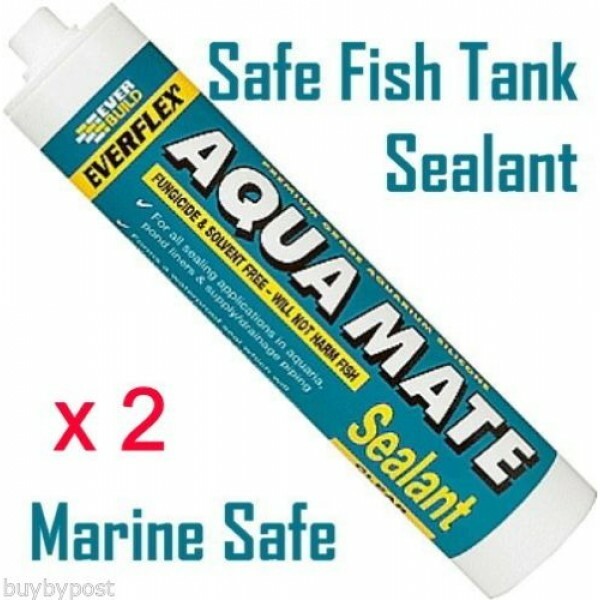 All sealing applications in aquaria. Sealing of pond liners and all supply/drainage piping. On highly porous surfaces such as new concrete, priming is advised. As pond liner materials vary in quality, always test a small area first for adhesion. Always wash out ponds and aquaria after use to remove residual acetic acid. Test pH before use. Allow sealant to fully cure before moving/filling with water. WATER HEIGHT (M) REQ GL. THICKNESS (MM) 0.6 0.3 8 1.0 0.4 8 1.0 0.5 10 1.5 0.5 12 1.5 0.6 15 NOTE: Edges of glass must be filed to avoid risk of injury in handling. It is also important to note that the aquarium must be placed on a level surface so that hydrostatic pressure is evenly spread. Sealing joint: the depth of which must be identical to the width of glass used. T = Tensile strength of sealant (kg/cm2) which for AQUA MATE is 10. Put base on flat surface.Apply bead of approximately 3mm diameter on the 2 large panels, placing it about 3mm from the edge. Place back panel. Press down to reduce joint thickness to 1-2mm. Hold in position (eg rest against back wall). Its better to leave the glass untill you are sure the silicone has cured. Apply beads of sealant to edge of small panel and corresponding large panel. Push edges of large and small panel together. Hold in place (temp) with adhesive tape. Repeat for second small panel. Fit front panel on last. Apply structural joint of required thickness to all internal faces and finish with dowel to push home sealant. Allow to cure for 24 hours before moving. Allow to fully cure and rinse out thoroughly before use. NOTE: THE METHOD DETAILED ABOVE IS SUITABLE FOR AQUARIA UPTO 400LTRS (85 GALLON) IN CAPACITY. Storage. Store in cool dry conditions between + 5C and 25C. The technical data contained herein is based on our present knowledge and experience and we cannot be held liable for any errors, inaccuracies, omissions or editorial failings that result from technological changes or research between the date of issue of this document and the date the product is acquired. Before using the product, the user should carry out any necessary tests in order to ensure that the product is suitable for the intended application. Moreover, all users should contact the seller or the manufacturer of the product for additional technical information concerning its use if they think that the information in their possession needs to be clarified in any way, whether for normal use or a specific application of our product. 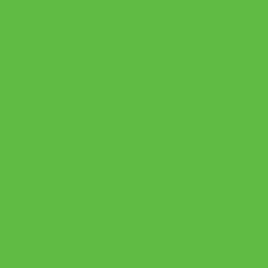 Our guarantee applies within the context of the statutory regulations and provisions in force, current professional standards and in accordance with the stipulations set out in our general sales conditions. The information detailed in the present technical data sheet is given by way of indication and is not exhaustive. The same applies to any information provided verbally by telephone to any prospective or existing customer.